The words came back to haunt me this week on picking up a copy of Urban Outlaws: Counterstrike, the fourth book in the series, which was published last week. The urban outlaws are five fearless young orphans (aged between ten and fifteen) who wield extraordinary skills, and work together to outsmart criminal gangs. Rather like Robin Hood and his band of merry men, they attempt to redistribute the wealth they gain among the poor and needy by carrying out random acts of kindness – RAKing. This series is not sci-fi like Battle of the Planets though – it is firmly grounded on Earth, with no planetary references or wings in sight. In fact, London is superbly depicted through an array of landmarks, such as the Shard, and building sites, as well as references to existing suburbs, such as Harrow. 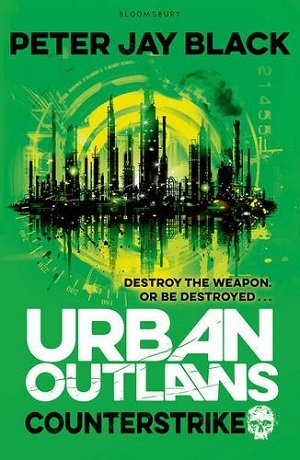 Urban Outlaws: Counterstrike is told from the point of view of Jack – the thinker and planner of the group, and at fourteen, the oldest. The main mission occurs near the end of the book, but the rest of the book is still action-packed and electric-charged as Jack and the team plot and plan and execute other small elements to prepare for the end game. They are attempting to break into the Facility and find the ultimate weapon – the Medusa – before their nemesis, baddie Hector, gets his hands on it. The action never stops – from the first sentence to the last – which ends on a whopping cliffhanger, ready for the last book in the series (November 2016). The imagery is great, the gadgets even better, and the use of computers and hacking is current and intriguing. Readers will whizz through this book – once picked up it’s really hard to do anything else! What’s more, the characters are all really different, and engage in banter just like in the best heist movies. There is bucket-loads of dialogue – and very little background information, so as in the TV series 24, the reader is carried along with the action with little time to think. But there are touches of humanity and background to each character, of course to imbue empathy and affection for the five orphans – I couldn’t get enough of Jack and little Wren. And in fact it is the littleness that creates some of the most exciting scenes – Wren is only ten, and useful as a decoy in much of the action – her scene lying on a skateboard to avoid being seen at eye-level was excellent. And their giggles just reinforce that they are children. Buy it here for your 9+ year olds. You’ll have to bribe them to stop reading!